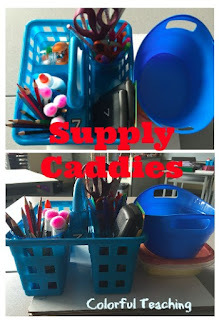 I've always struggled with managing supplies, but this year I decided to create these caddies at each work station (table group). In my classroom I have 12 work stations each with 4 desks. In the middle of each station is the caddy with all the supplies. Each caddy is numbered and all of the supplies in it have that same number. ★ Rowdy in Room 300 has a great post on Tidy Tubs - she even offers a free label. For mine I just made sure the station number was on it. These containers also came from the Dollar Tree: four for $1. ★ Teach Junkie has collected all the Glue Sponge Tutorials you'd want. Again I got my items for this at the dollar store. This has save me so much even with my 7th graders - and they love them. ★ Everyday with the Jays has a nice tutorial on putting pom-poms on the dry erase markers. This saved me a step and an extra supply in the caddy. They do need to be replace every so often though, depending on how much you use your dry erase boards in class. P.S. My dry erase boards are shower board cut in to squares from Home Depot. 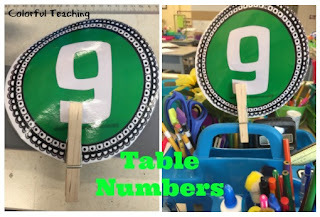 ★ One of the freebies I'm offering today through my TpT store is the station numbers that I put on the top of the caddies. These have helped me to keep supplies straight... when there is a pen on the floor and it's labeled it's easier to put it back in the correct spot. I've also noticed that when my supplies have traveled that other teachers will bring them back to me as well because they know it belongs to me. 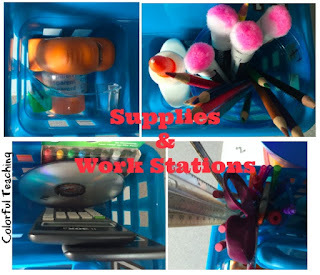 ★ A benefit of these stations has been the colored pens. Students have made their notebooks and classroom work a lot more colorful. This has given opportunity for great note taking, and added bonuses when they need to correct a paper. I do a few things to keep this whole process in check. 1. 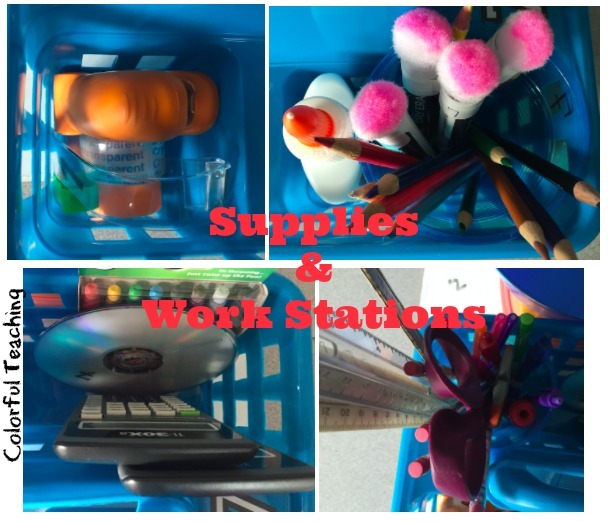 I do have a "Supply Monster" come once a week - the kids don't know when, and that table group will get a prize if their supplies are all there, neat and their tidy tub is neat. The second freebie is a Supply Monster Cards that I leave on students desks. I have student exchange the card for a treat; usually a mint, smarter, or pencil. My seventh graders love the supply monster and never let me go a week without awarding a work station. 2. I also have a poster (picture to come soon) in my classroom so students know what supplies are in the caddies and how they are organized. I hope this helps you with your supply management! I have been working on some new assessments for my classroom and decided to put them on TpT store so I could share them all with you. Our school has just officially embraced standards based grading. We have been using 4-1 (Exceeds, Meets, Partially Meeting, and Does not Meet the standard) for a while, but also gave a corresponding letter grade to go with standards based grades. The letter grades made it so that no one fully embraced "meeting the standard." This year we got rid of the letter grades and are changing the mindset of our students, teachers and community. That is a huge task, even if you're on board. 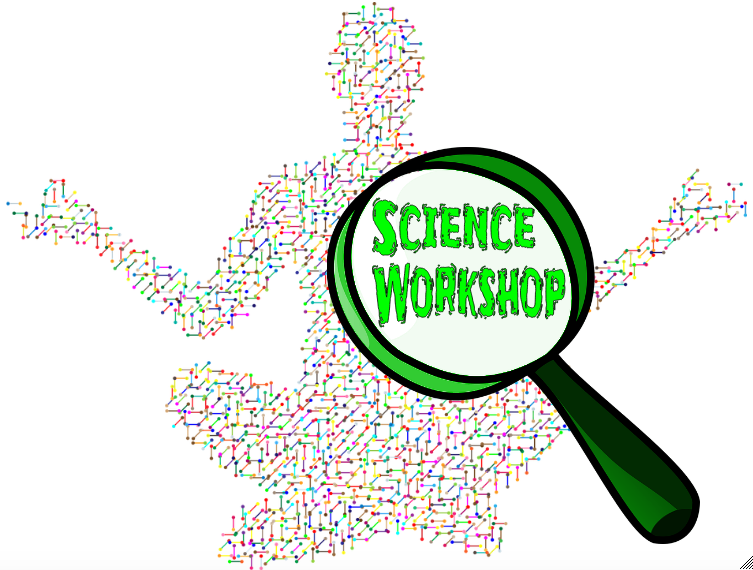 So I've started slow with the NGSS standards that I am currently teaching. I've use a template of Marzano's scale and the NGSS standard to create an assessment. A passion turned into a resources I can use.... how exciting! So I love to draw!!! But now I've found a way to take those drawing and incorporate them into my teaching resources digitally. That's AWESOME! 1. I found this great blog "A Turn to Learn," which gives you direction in how to turn your drawings into clipart. So with the combination of the two... I created some clipart... because it's the first (hopefully of many) that I've created I am giving it to you for free. Whew what a busy week! It's nice to be back after April vacation but it's always the longest week. Before break we were dissecting frogs as a culminating activity on the human body. If you're not sold on dissecting... here are the top 5 reason on why you should do dissection in your classroom. This is the obvious one... students can apply what they learn about the human body and see it first hand on the frog! I know... I know this one doesn't seem like a reason to convince you! However... if you did any dissection in high school or in the middle school years you remember how horrible the smell was. However, now you can order frogs that are not kept in formaldehyde... so the smell isn't so bad. The activity is worth the minor smell for a few days! #3 The Curiosity that Comes Alive! My rule for dissection is that students don't have to be the ones to cut, but they do have to observe. I tell them that if they don't want to cut they need to find a willing buddy to do the dissecting part. 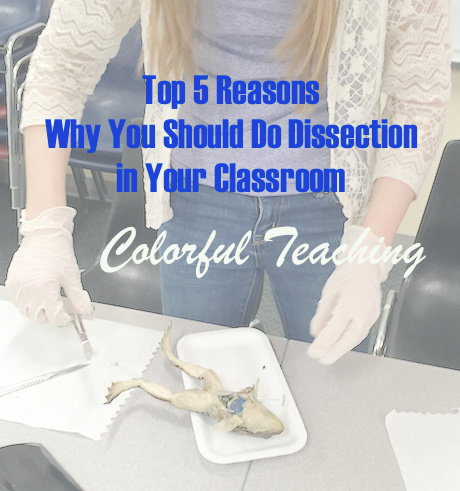 It's amazing because by the end of class every students is involved and curious about the dissection. This year I used a paper frog first, which generated a ton of curiosity with students. The one I used is from Getting Nerdy with Mel and Gerdy, it was easy and the kids LOVED it! 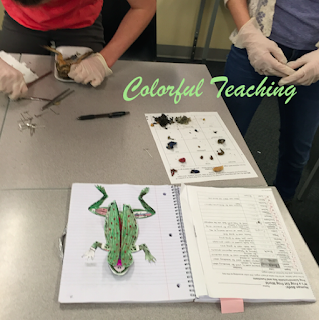 The picture below shows the kids dissecting with their science notebooks open to the paper frog they had made before hand. There are few lessons where you get to choose large group or small groups and still have every students focus and engaged. In my classroom we are able to get enough frogs so that students can choose to be in groups of two to four. Most of my students picked to be in groups of twos or threes. 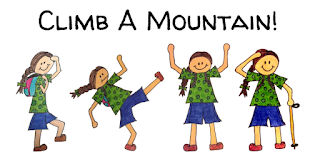 However, this activity could lend itself to do it as a large group. You could purchase one frog and dissect it under a document camera. I would still allow students that wanted to do the dissecting, that way it still gives them some hands on experience with the frog. Another bonus to whole group means it can still be done even if you don't have funding for every two to three kids to have their own frog. #1 It aligns so well with the Human Body! And here is where my freebie comes in... Dissection Organization at it's best! 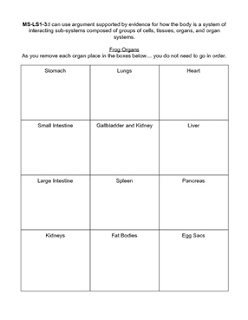 I did two days of dissection and the first day I didn't use this sheet... For the second day I found this idea on Pinterest, there was no link just a picture, so I created a sheet my kiddos could use. Check it out in my TpT Store. It gave the space for the kids to find all of the organs and allowed me to do a quick assessment that they were able to see it all. At the end of the day were were able to do a gallery walk and see everyones dissections and how the organs differed in different sexes, as well as different specimens. 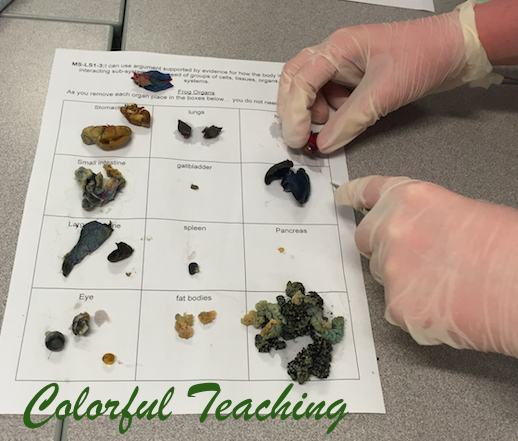 I am hoping this helps you and that you'll be willing to try dissection in your classroom. Let me know in the comments if you have any great tips when you're dissecting. This is my first year teaching 7th grade and I'm in a fabulous place where I can grow and learn as a teacher. One of the things we are doing to engage our students is to have our students applying their learning. I start with a capacity matrix and end with a project to apply students learning. The first project that my team is doing is a film festival. Students are learning about both science and social studies concepts and have to make a 10 minute film to show their learning. I'm not sure if you've used capacity matrix but it's awesome and really allows the learners in my classroom to be independent and direct their learning. It also allows students to each have a different learning path. This school has some example of capacity matrix. In our classroom we are doing it a little different. We have four columns: 1. Learning Target (this is what we want the students to be able to do). 2. Input Resources - these are what information the students needs to receive in order to understand a concept. These input resources can be a teacher lesson, a video, a prezi - anything where students are getting the information. 3. 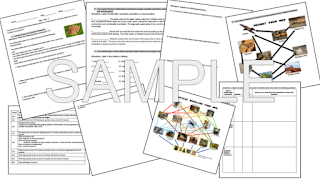 Evidence - this is an activity, worksheet or exercise which students are able to practice and improve their skills and show proficiency. With the evidence there is a place for students to correct their work. If students are stuck their should be an opportunity in this column for extra practice. This is also where the teacher can check in and provide mini-lessons for students that are stuck. 4. The last column is the check in. This is a mini "quiz" where students are showing that they have mastered the skill. Students do this and then check in with the teacher. If their check-in is correct they can move onto the next standard. (I have taken some of the links off because they are attached to my school google drive for my students) So I would normally have all of these section filled in. This particular matrix has six learning targets. Use these to get information when you are working ahead or when you need to review a skill or concept. Do these activities and practice exercises to improve your skills and show proficiency. Do these to show you have mastered a skill. These should be printed and then check in with a teacher. 7BE.2 I know the various resources which organisms compete for in different biomes. 7BE.2a I can name 7 major biomes and generally locate them on the map. Biomes Map - make sure you read about the map too! Biome MAPS - make sure you read about the map too! Click on a section to see where your specific biome is. One of the activities I've created for students is a sorting activity to go with biomes. Hope you find this helpful and have a Happy Thanksgiving.